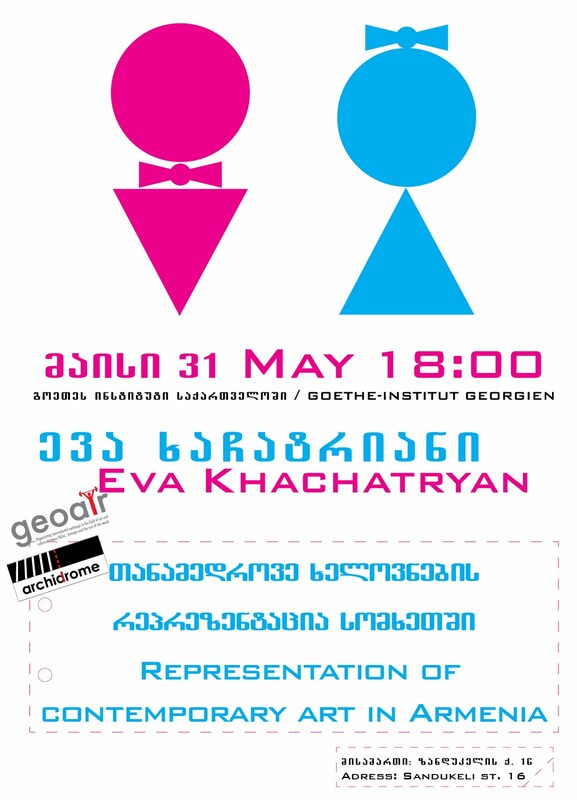 Presentation / 31.05.10 / Goethe-Institut, Sandukeli 16, 0108 Tbilisi. პრეზენტაცია / 31.05.10 / გოეთეს ინსტიტუტი, ზანდუკელის 16, 0108 თბილისი. ევა ხაჩატრიანი დაიბადა 1977 წელს ერევანში, სადაც იგი ცხოვრობს და მოღვაწეობს. ევა ხაჩატრიანი დამოუკიდებელი კურატორი და AICA (საერთაშორისო არტ კრიტიკოსთა გაერთიანება) სომხეთის წევრია. 2003-08 წლებში ხაჩატრიანი კურატორად მუშაობდა თანამედროვე ექსპერიმენტული ხელოვნების სომხურ ცენტრში (ACCEA). 2006-08 წლებში კი იგი ამავე ცენტრის ვიზუალური ხელოვნების დირექტორის მოადგილე იყო. ამჟამად იგი თავის პროექტებს Suburb კულტურის ცენტრში ახორციელებს. ხაჩატრიანი არის http://artnews.am ვებ-გვერდის თანადამფუძნებელი, რომელზეც თვეში ერთხელ სომხეთის თანამედროვე ხელოვნების სივრცეში მიმდინარე მოვლენებზე ახალი ინფორმაცია იტვირთება. მისი უახლესი კურატორიული საქმიანობა გენდერის და ახალი მედიებს თემას ეთმობა. თავის პრეზენტაციაზე ევა ხაჩატრიანი განიხილავს სომხეთის ინსტიტუციონალურ სივრცეში თანამედროვე ხელოვნების რეპრეზენტაციის თემას. იგი ისაუბრებს სხვადასხვა ორგანიზაციების, კერძო პირების და კულტურული ოპერატორების საქმიანობის შესახებ, რომელთაც დიდი წვლილი მიუძღვით სომხეთის თანამედროვე სახელოვნებო სივრცის ფორმირებაში. პრეზენტაციისას ასევე ნაჩვენები იქნება სომხეთში მცხოვრები ხელოვანების ნამუშევრები. Representation of Contemporary Art in Armenia. Eva Khachatryan was born in 1977 in Yerevan, Armenia, where she lives and works. She an independent curator and member of AICA Armenia. Between 2003-2008 she was working as a curator at the Armenian Center for Contemporary Experimental Art (ACCEA) and between 2006-2008 she was holding position of co-director of Department of Fine Arts at the ACCEA. At the moment she is realizing her projects at the Suburb Cultural Center. She is the co-founder of the new web site http://artsnews.am, which is updated per month and focused on representation of contemporary art situation in Armenia. Her recent curatorial work has been mostly on women‘s issues and new media in contemporary art. During the talk Eva Khachatryan will explore the representation of Contemporary art in Armenia through institutional environment. She will describe activities of some of the organizations and individuals, cultural operators, which play important role in formation of contemporary art scene. 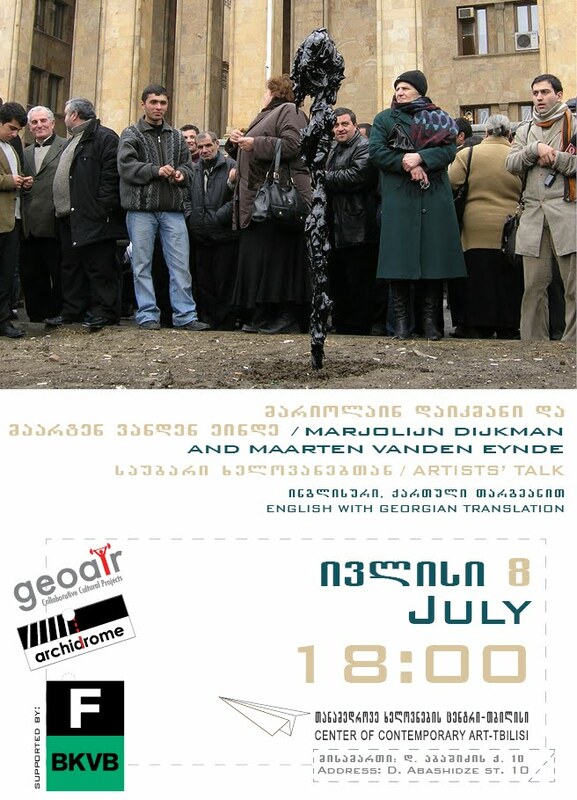 During presentation will be shown also some works of artists based in Armenia.